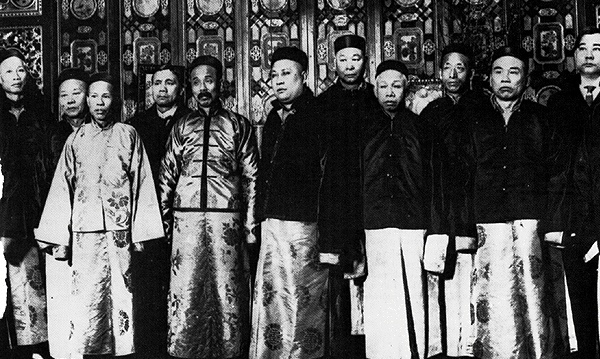 Officers of the Chinese Six Companies ("Chinese Consolidated Benevolent Association") in 1890. 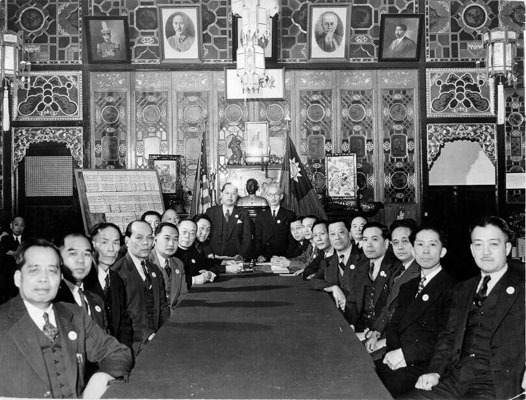 Representatives of the Six Companies meet in their hall, 1943. Though most Americans didn't realize it, the Six Companies that ruled Chinatown were relatively benevolent organizations. They were formed to help the Chinese come from and return to China, to take care of the sick and the starving, and to return corpses to China for burial. Later, they tried to protect their people from the abuses San Francisco's Chinese suffered at the hands of racist hoodlums. They were run by the richer and better educated among the immigrants, in the paternalistic manner typical of 19th century Chinese society. By 1868 the original Kong Chow Company had split into six: the Sam Yup Company, the See Yup Company, the Ning Yuen Company, the Yeung Wo Company, the Hop Wo Company and the Hip Kat Company (the latter being the favorite among Chinese beatniks). Distinct from the Six Companies were the secret societies which later became the notorious "fighting tongs." Though some have said that the tongs were a purely American phenomenon, they evolved from the secret societies that flourished in China. One of the biggest was the San Ho Hui, or Triad Society, alias the Hung Society and the Society of Heaven and Earth. 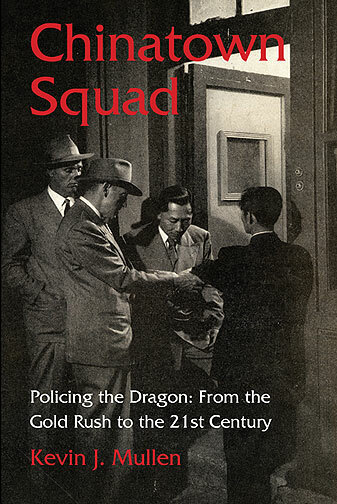 Originally a secret, revolutionary political organization opposed to the Manchu dynasty, in San Francisco it became something akin to a Chinese version of the Cosa Nostra. By the late 19th century, the San Ho Hui had evolved into a hydra-headed mass of warring tongs, each fighting for its piece of the opium, gambling, protection, and yellow slave trades. By the end of 1850 the [Chinese] population had increased to 4,000, and by 1852 there were 18,000 Chinese in the state. As did other Gold Rush arrivals, most headed for the mining regions, where they worked in gangs to extract gold from the placers. But some settled in “Chinatown,” at first centered at Sacramento and Dupont (Grant Avenue) streets. Because of the unfamiliarity of the mostly agrarian newcomers with the economic cultures and customs of the overseas settlements, a number of societies—some of them indigenous to the old country—emerged to facilitate their survival in the alien world. Governmental mandarins did not accompany the migrants because the Manchu rulers of China discouraged emigration. In their place—in addition to family associations, which admitted to membership all having the same surname—merchant companies called huiguans rose to prominence. The first such huiguan organized in San Francisco in 1850 was the Kong Chow Company. In 1851, the Sam Yup Company was formed out of three of the districts not covered by the Kong Chow Company. And later the Sze Yup Company split off from Kong Chow. By 1854, there were four companies, known as the Four Great Houses and by the 1860s there were six major mercantile huiguans. The huiguans smoothed the way of their immigrants members by organizing sea passages from China and home again, negotiating with contractors to supply gangs of laborers, and looking out for the interests of their members generally. They are the direct linear antecedents of today’s Chinese Benevolent Association, better known as the Six Companies. Also among the newcomers were Triad (“Hung”) societies, members of which were rounded up in Marshal Sequine’s raid. The Triads can be traced to Seventeenth Century China, when groups of patriotic Han Chinese were formed to fight Manchu conquerors and restore the Ming Dynasty. Their origins were political, but by the mid-Nineteenth Century, many Triads had moved away from their idealistic political origins and evolved into highly organized crime syndicates. Then there were the tongs, reputed by some to have been first organized in California to protect the Chinese newcomers from abuse by white miners. In fact, some, like the Chee Kung Tong (the same group of which Allen Leung was president in 2006) were transpacific incarnations of criminal Triad gangs originating in China. Other tongs were less ominous, organized as they were among smaller family groups to defend themselves against the oppression of the larger family groups. Still other tongs were largely trade associations or workers’ guilds organized to look out for workers’ rights or apportion business among members. There has been much puzzlement over the years about the exact nature of and the relationships between the various associations in Chinatown. On the one hand there are those who claim that they are all strictly benevolent societies sometimes having a few criminal members. Others assert that many of the associations are essentially criminal enterprises with a gloss of respectability. From the start, as evidenced by the testimony of Tong R. Achick at the trial in 1854, many of the members of the district associations opposed the criminal gangs. But it was also evident from the start there was much common membership in the Triads. Norman Assing (Yueng Sheng) perhaps best personifies the associational schizophrenia. Assing departed from China—according to one account—sometime in 1847 following the defeat of the Red Turban Uprising against the Imperial Manchu regime, in which he took part on the losing side. He arrived in San Francisco before the Gold Rush and assumed a prominent place in the emerging Chinese community. He established a mercantile store on Montgomery Street and also started a restaurant at Commercial and Kearny streets, named—-perhaps prophetically—The Golden Dragon. But in addition to his more legitimate businesses he also ran a brothel on Jackson Street with prostitutes imported from China, and was, according to historian Benson Tong, both a member of a huiguan and of a Triad gang. Cross-membership in criminal/non-criminal associations were, and are, quite common.